The final hotel on our Cornish road-trip proved to be quite something! 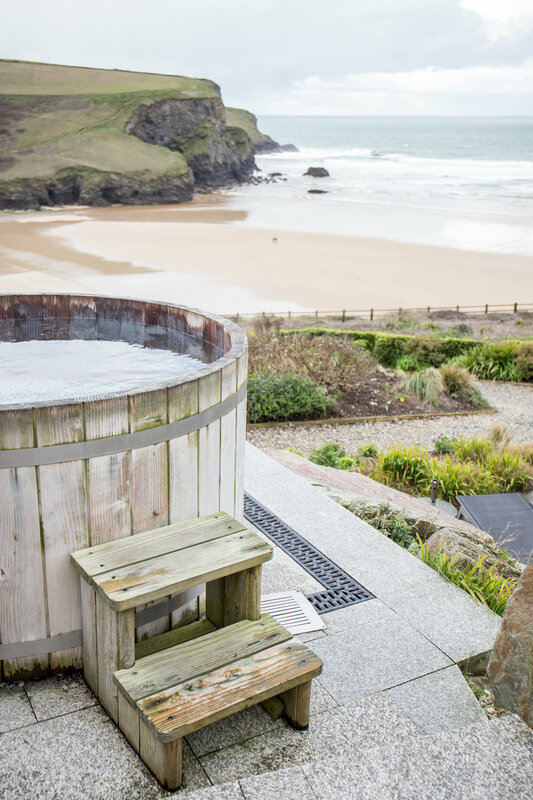 A luxury eco-hotel only for grown-ups, The Scarlet Hotel is perched on Mawgan Porth's cliff top near Newquay. and is an ideal spot for anyone looking for a bit of relaxing downtime - i.e. ME! We arrived late afternoon to be greeted by a member of staff who appeared from out of nowhere (there's no reception area at the hotel, all you have to do to catch someone is hang around the seated area and they'll come right out from their office to assist - I promise it's less Big Brother than it sounds!). We checked in and headed to our abode for the evening, Our room - number 17 - was one of the hotel's 'Indulgent' rooms, bigger than some of the places I've lived in in London! It came complete with an outdoor terrace, an open plan bathroom with free-standing bathtub and the most insanely amazing monsoon shower, as well as a large seating area and plenty of, well, space! Space to dance, swing a cat or dance around swinging a cat. At around 7pm, it was time for something rather exciting: a sunset hot tub overlooking the beach. Yep, it was as heavenly as it sounded, even with a brief spout of rain quite literally trying to rain on my parade. With nothing but the sound of the sea and the warmth of the hot tub keeping me company, it was nothing short of a magical experience. I can't recommend it enough, so promise me when you go you'll book one? A sunset soak was followed by dinner in the hotel's restaurant. Tables were filled mostly with couples and all were positioned perfectly to give each table a slice of people-watching goodness. Dinner (not photographed because for once, I decided to leave the camera behind - and besides, I wouldn't have done the photographs justice in the restaurant's low lighting) was sublime - we greedily finished off every course and practically rolled ourselves back to the room. If you can just about face pulling yourself out of bed in the morning, breakfast is on the cards. Served from 8am - 10:30am in the restaurant, this time with the floor to ceiling curtains are pulled back revealing beautiful bay views. The menu is short but sweet, with an array of delicious dishes including Oak smoked salmon & scrambled eggs and homemade granola to pick from. We couldn't get enough of the Polgoon Cornish apple juice which awaits you on the table - seriously, I'm an OJ kinda girl but this juice swayed me to the other side! After breakfast we packed up our things, loaded the car and said goodbye to The Scarlet - wishing we could stay just one more night to make the most of the hotel's spa and pool facilities (there's an indoor and outdoor pool - for those brave/foolish souls!). But sadly, our time in Cornwall was to be up - on this occasion. I'll most certainly be back one day soon. And yes, I'll be booking that hot tub!